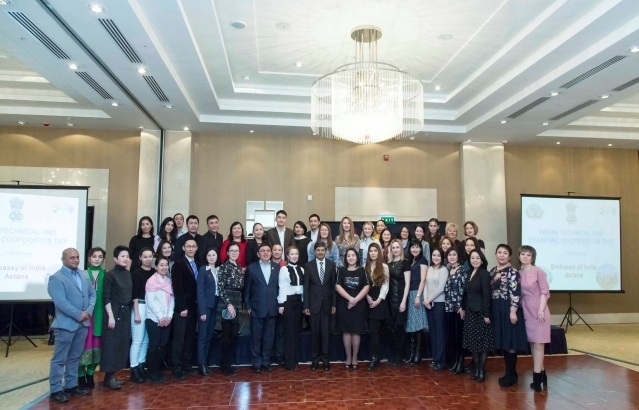 The Embassy of India celebrated ITEC Day in Nur-Sultan on 13th March 2019 at Marriot Hotel. About 90 persons including ITEC alumni, representatives of local educational institutions and journalists attended the event. The celebrations commenced with Indian traditional way of lighting lamp by Ambassador followed by ITEC alumni sharing their experience and memories, with powerpoint presentations and videos, of ITEC Training courses undertaken by them in India. The event was graced with the Ambassador’s informative and inspirational speech. “Pioneers of Quepem”, Music & Dance Troupe from Goa performed a Music and Dance show on the occasion. The guests enjoyed buffet dinner of Indian cuisine arranged by the Embassy. Mementoes were presented to the ITEC alumni and other guests as a token of the memory of the event.